CMC Cannes Riviera Gastronomie Maritime, Gare Maritime, jet Albert-Edouard, Cannes 06400. 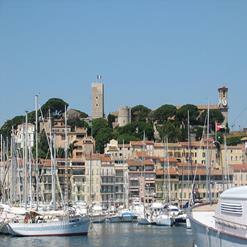 Enjoy the view of Cannes from this luxury ship. You can choose to do either a lunch tour or an evening dinner tour. For a one flat fee you receive lunch or dinner and a tour whilst enjoying live music. The tours run daily from 12:30-15:00, 20:30-23:30.